We recently had the chance to review BENGAY Pain Relief+Massage. The makers of BENGAY®, the original topical analgesic balm created more than 100 years ago, introduce BENGAY® Pain Relief + Massage, a specially designed massaging applicator combined with the brand’s powerful pain relieving formula that provides a targeted, no mess way to directly treat sore and tender areas of the body. Based on current research, BENGAY® Pain Relief + Massage was developed to leverage findings which state massage is one of the most preferred methods to relieve pain. As a means to continuously pursue innovative ways to bring safe, effective relief to sufferers, BENGAY® Pain Relief + Massage contains a twist turn cap with unique massaging nubs allowing for the targeted aid of a massage plus the deep penetrating power of BENGAY® for ultimate relief—all without getting your hands messy! Designed with a vanishing scent formula, BENGAY® Pain Relief + Massage allows pain relief to be direct and discreet – meaning living ache free now comes with no mess, no fuss and no lingering smell. · The legendary pain relieving power of BENGAY® gels"
What we thought: BENGAY's newest product was pretty cool. I had a little trouble opening the top, but since figuring it out I have become a pro:) The top is unique in that you can twist it to squeeze out a small amount of the gel and then close it to rub the gel in. 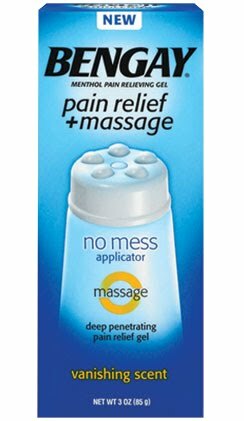 This way your not accidentally squeezing the entire bottle onto your skin:) The massage nubs were pretty nice and allow for a pretty deep massage depending on the amount of pressure you apply. The relief from aches and pain is pretty instant, just like with other BENGAY products. The cool thing about this gel is that while it has the strong menthol smell at first(which I personally love, though I know not everyone else is fond of:) the smell quickly dissipates after a few minutes. This is a really great advancement in muscle ache treatment, because you can get no-mess massage "therapy" with some of the best pain relief gel out there:) ABCD Diaries gives BENGAY Pain Relief+Massage an A+! Win It: BENGAY has generously offered one ABCD Diaries reader a tube of Pain Relief+Massage! To enter, follow our blog via GFC and comment below. Giveaway ends Tuesday, March 8, 2010 at 11:59cst. Winner will be chosen via random.org and emailed. They will have 48 hours to reply. Open to US residents 18+:) No PO Boxes. Disclosure: ABCD Diaries was given a product sample for review purposes only. We were in no other way compensated. The opinions expressed in this post are ours and ours alone. I am a GFC follower. This works so well!! i have used bengay on & off for years! I follow as Renee G on gFC and would love to try this. I entered A Winter Tale giveaway. Also entered the Truvia giveaway. I follow via Twitter @sarohioan. I follow on GFC. I will have to try this out.Thanks! I follow on GFC as theolotto. I'd like to try this. I don't like the kind where the smell is strong for a long time.